Activyl works in a different way to other flea control products - it will only become fully active once it is actually inside the flea. When a flea is on your dog it ingests the active ingredient in Activyl from your dog's skin. Then, enzymes within the flea convert this compound to its highly active form which then paralyses the flea and it dies. When the compound is just sitting on your dog's skin it stays in the less active form. Activyl is presented in a easily opened applicator, like many other flea spot on products. Once opened, part you dog's hair and place the applicator at the base of the skull near the shoulder blades and squeeze the contents directly onto the skin. 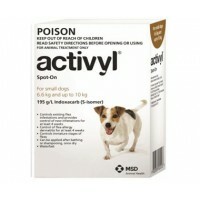 Activyl will start killing any fleas on your pet within 12 hours 90% of the adult fleas will be dead. It will keep on killing fleas for over 4 weeks. Activyl has been tested to make sure it is not easily washed off. It is reccommended that your don't bathe or let you pet swim in the 48hrs after Activyl application, then it will stay active on the skin despite weekly bathing or swimming and even exposure to rain. Fleas that get on your dog will become paralysed and die. Killing adult fleas prevents your pet itching, reduces the symptoms of flea allergy dermatitis and stops the spread of diseases such as tapeworms. Will break the flea life cycle by controlling immature stages of the flea in the environment which prevents reinfestation and keeps your home flea free. Fasting acting - fleas are starting to die within 8hrs. 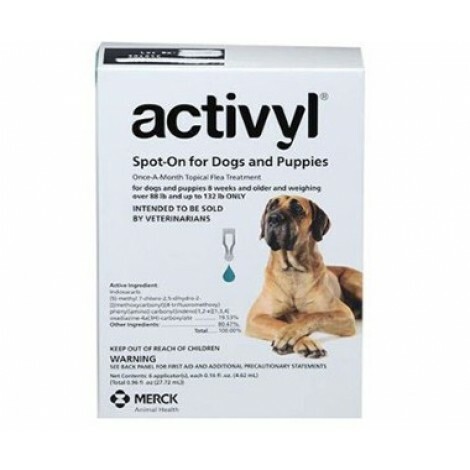 Active Constituents: 195 g/L Indoxacarb ( S-isomer ) Activyl for Dogs 14-22lb (6.6-10kg) ..